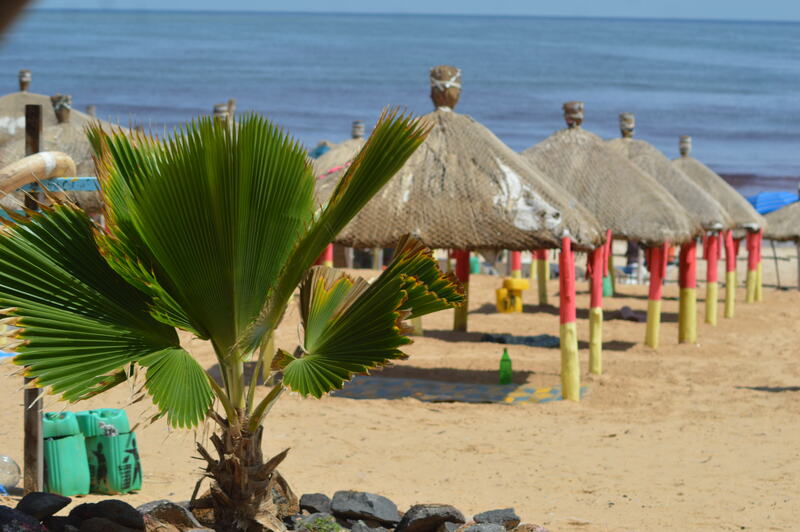 Welcome to Surf Camp N’Gor in Senegal close to the country’s capital Dakar. A paradise feeling on a small African Island surrounded by some world-class waves. 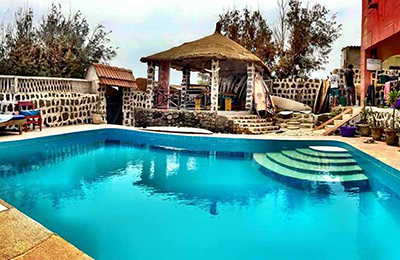 Close to the capital city of Dakar, the surf camp offers a nice and clean place for you to relax and enjoy our Endless Summer type of life. Due to Senegal’s prime location at the most Western point of Africa, it enjoys potentially the largest swell window in the whole continent. The mainland peninsular receives swell from the North, West, and South. The waves in the area are very consistent all year round in fact about twice as consistent as in France and Morocco during summer months. Surf Camp N’Gor The offers a chillout area with a heated pool, sunbeds and outside showers – a perfect place to chill out after a long day surfing. The camp is located in one of the highest spots on the island. Sea views open almost from every side of the house. The most spectacular of all is, of course, the 360-degree roof terrace view of all the waves surrounding N’Gor. Gaze over the sea and enjoy mesmerizing sunsets at the most western point of mighty Africa. Surf Camp N’Gor proposes single and double rooms with comfortable beds, mosquito nets. At your disposal are private bathrooms with sun-powered hot water from the solar system making your surf stay completely environmentally friendly. At the camp you can choose amongst single and double rooms. All the rooms are equipped with comfy beds and very useful mosquito nets. Moreover, at your disposal are private bathrooms with sun-heated hot water from the solar system. The two dorm rooms options are a part of the main house. Breakfast and dinner with a stunning sea view every day. A selection of a hearty range of savory food for breakfast like exotic West African fruit and jams, seasonal fruit of Senegal, cheese, butter, honey and more. A selection of beverages like coffee, tea, hot chocolate and local Senegalese tea. Daily cleaning, laundry service at your request and helpful staff to make your holiday even more pleasant and enjoyable. It just gets better not only for you but also for the environment as all our energy comes from solar systems. All the lights, fans, plug sockets for your devices, wireless internet, hot water, and showers are power by African sun and provide all the comfort. Besides, we collect plastic for recycling, and we have own compost at the camp. Due to Senegal’s prime location at the most Western point of Africa, it enjoys potentially the largest swell window in the whole continent. The mainland peninsular receives swell from the North, West, and South. 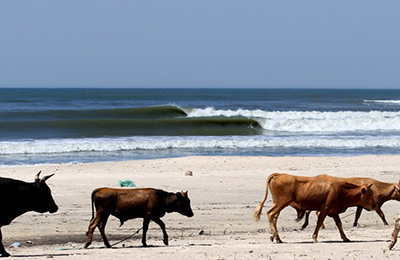 The waves in N’Gor are consistent all year round. At N’Gor surf camp we offer lessons for all levels. From people that never saw a surfboard or the sea, to people who already have previous experience of surfing but want to improve their technique and maximize wave count. Surf camp coaches are all local surfers and some are recognized at the National level. 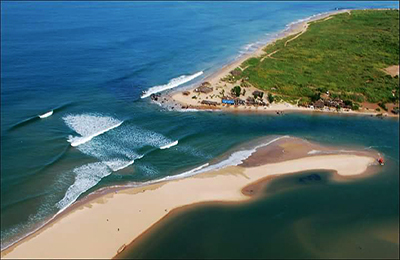 They will teach you how to surf, guide and give you an authentic African surfing experience. Surf lessons last 1,5 hours and include a surfboard, wetsuit and surf wax. Each day of your stay one of our local surf guides will take you out to the best of 21 spots. At Surf Camp N’Gor we strive to make sure that our guests are at the best place at the right time to make your surf trip to Senegal as great as possible. Checking up on local swell forecasts and most importantly watching the spots at first light. If the conditions are right, the camp bell will be ringing, and we are off for a sunrise session before breakfast. There is always a cup of fresh coffee and some fruit to power up before going out the door. Our boatman resides at the camp and will take you to the mainland or a surfing spot by boat. At 10 O’clock after breakfast with a view, we get an update on the swell and plan accordingly. Then surfing all day long! Our driver is waiting on the mainland in case if that’s where our crew finds the best spots of the day. Bai Dam is on standby all day ready to take us to the places around N’Gor Island. Get excited and check out surf forecast here. Also, we recommend to check out 10 things to do in Dakar. Just 15 minutes from Dakar Airport. Only an extra 90 minutes of flying beyond Morocco to get to Senegal from Europe. Surf camp provides airport transfers, good food, expert surf coaching, and equipment hire within a comfortable setting, a non-violent and tolerant country where you can wear what you like and enjoy a cold beer. Dakar is the capital of a West African country Senegal. It’s an Atlantic port that sits on the Cap-Vert peninsula. Its traditional Médina district is home to the Grande Mosquée, marked by a towering minaret. The Musée Théodore Monod presents cultural artifacts including drums, clothing, carvings, and tools. The climate in Senegal is tropical, thus is mostly hot and humid. There’s a rainy season (July to October) with strong southeast winds. The dry season (November to June) is dominated by hot, dry, harmattan wind. From the 1. of May 2015 it will no longer be necessary to obtain a visa for traveling to Senegal. You will just get a stamp in your passport upon arrival. Malaria prophylaxis recommended if you travel inland or in the south of Senegal. As part of the surf camp package, the team will arrange your transfers accordingly. Fly to Dakar International Airport (DKR) also known as Léopold Sédar Senghor International Airport. Visit the official website of Dakar International Airport for more info.